The trainer’s race for the top spot at the winter’s meet at Hawthorne turned out to be a nip and tuck battle with four barns all within a few winners of each other going into the last few nights. As it turned out, the No. 1 stable at the meet was decided before Monday’s program even got under way and it went to the self-described “Blue Collar” barn of conditioner Loralee Johnson, her first ever training title. When Loralee’s pacer Sleazy Joe (Ryan Anderson) won Sunday night’s final race it gave the Elwood, Illinois resident her 18th winner, one more than Tom Simmons and the Springfield based trainer didn’t have any horses going postward on Monday’s card. Loralee had horses in two Monday races and her 19th meet winner came when the ICF 4-year-old pacer Cuinthepurplerain took the fourth event on the card. Simmons ended up with 17, the Terry Leonard Stable just one behind at 16 and Payton Ode was right there with 15. And, I might add, it was accomplished the old-fashion way with mostly claimers and low and middle-end conditioned horses. “We don’t have what you might call any of the top horses, just the blue-collar type,” said Loralee. “And we don’t have big owners. Most of the horses in the barn are owned by the people who work on them every day. We all work hard and it paid off at the winter meet. I am amazed that we’ve done so well. Loralee was involved with jumpers at an early age and began working with harness horses even before she was a teenager. Was Loralee keeping a close eye on the Hawthorne trainer standings? Loralee went out on her own as a trainer in 2014 and had 24 winners. That total jumped by 35 the following year. In 2017 she had 28 horses make stops at a winner’s circle and her stable earned her current high-water mark of over $196,000. With 19 firsts, 17 seconds and 17 thirds and a winning clip of over 21 per cent at the Hawthorne winter meet, the barn’s horses have brought in over $104,000 for the first two months of the year. You can expect the stable to be back for Hawthorne’s summer meeting. “We prefer to race at Hawthorne,” continued Loralee. “We only have a few horses that fit at Hoosier. Most of my horses are bettered suited for Hawthorne. For example, Mobile Big John likes Hoosier but he loves Hawthorne even more. 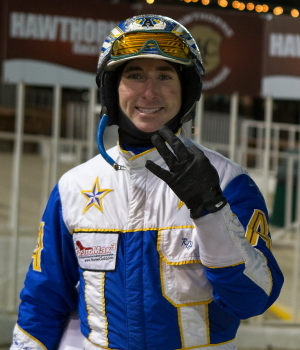 Casey Leonard won his fourth consecutive driving title at Hawthorne and this one was close unlike his previous three. 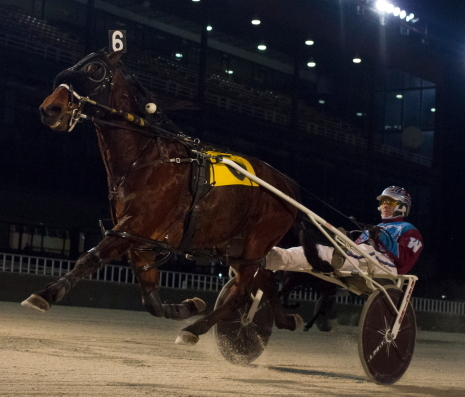 The 40-year-old Harvard, Illinois native had 38 victories with a 21.7 per cent winning clip. Sam Widger was only three behind with 35, edging Brandon Bates, who had 34. Kyle Wilfong (24), Todd Warren (22) and Mike Oosting (21), all bettered 20 dash winners as well. Mike Paradise’s weekly column will appear every Friday through the end of April. His weekly stories and harness line and comments will resume every live racing night with the opening of Hawthorne’s summer meeting. The curtain comes down on the 2018 winter meet at Hawthorne. After Monday’s ninth and final race of the night is over the Chicago harness racing circuit will lie dormant for the next 11 weeks until the summer meeting gets under way on Friday, May 4. The outcome of the Hawthorne’s driver’s race has not been officially determined. Nevertheless it appears Casey Leonard has successfully defended his title after a driving triple on Sunday’s card. Casey goes into Monday’s final program with 38 winning drives, five more than Sam Widger’s 33. Brandon Bates has 32 drives. Casey captured both the 2016 winter and summer meeting titles and last year’s solo summer session as well. The trainer’s race for the winter meet has been a hard fought battle all meeting long. Loralee Johnson moved into the top spot with 18 last night when she sent out two winning horses. Tom Simmons is one behind with 17. Right there are trainers Terry Leonard with 16 and Payton Ode 15. 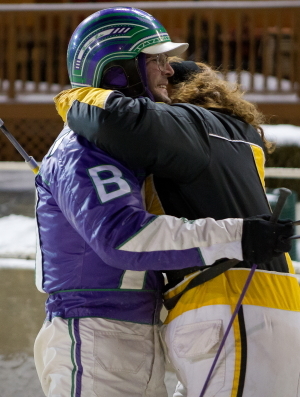 Sunday’s Features: A pair of back-to-back Open III Paces highlighted last night’s program and Sam Widger brought home both of the victorious horses. The fifth race filly and mare pace saw Sammy steer On The Cusp ($7.20) to a game front-stepping triumph. The 11-year-old veteran mare had to work hard for her 30th career victory. She was parked out to the 28.2 first quarter to make the front, gave it up to Bucklegirl Bobette, and then came out and regained it at the 57.1 first half. Once there for the second time On the Cusp put away all challengers, pulling away by almost three lengths in the 1:54.1 mile for trainer Payton Ode and his Indiana owner John Langacher. The 33-1 longshot Morgangetsherway (Juan Franco) edged out Bucklegirl Bobette (Mike Oosting) for second. The Tom Simmons Stable’s Aimo Hanover ($2.60) left no doubt he was the best in the sixth race Open III for male pacers. The six-year-old gelding was hustled out of the outside six-slot by Widger who had the gas pedal down throughout the 1:51.3 mile, the fastest of the Hawthorne winter meet. Aimo Hanover paced the first quarter in 27.4 and then rattled off three consecutive 28 flat panels to nail down his second triumph in a row for Clinard Properties of Mount Sterling, Illinois. Gibbs (Brandon) Bates rallied for second while Fox Valley Reggie had a solid effort to be third. Sagebrush Shocker and Fox Valley Skywalk came through with victories last night in their respective $25,000 Late Closer Finals for 3-year-old ICF pacers but there were some nervous moments for their supporters in both races. Driver Brandon Bates gave Sagebrush Shocker ($4.80) what turned out to be a winning pocket trip but for most of the stretch drive it appeared the Kim Roth trained gelding wouldn’t find racing room behind the pace-setting Frontier Frank (Mike Oosting). Sagebrush Shocker did in deep stretch and rallied in time for his 1:56.3 victory. The 10-1 longshot Adele’s Big Party had a big effort for his new driver Todd Warren and finished strong to be second, beaten three-quarters of a length while Frontier Frank settled for third. The $12,500 winner’s sale of the Doc Walker Final for state bred colts and gelding saw Sagebrush Shocker’s Hawthorne earnings rise to $23,100 for owners Ken Rucker (Muncie, Indiana) and Ashley Russell of Beauford, South Carolina. Bates would go on and finish the Saturday card with three consecutive victories, clicking with Dragon Jewel in the eighth and Fox Valley Cupid in the ninth, the latter another Kim Roth trainee. The $25,000 Doc Walker Final saw the heavy t 1 to 2 favorite Fox Valley Catwalk complete a sweep of the filly series for driver Tim Curtin however for a while her backers were ready to tear up their tickets. Fox Valley Catwalk was about to clear to the lead right before the first quarter pole when she went off stride. The Sportsmaster filly had to be taken back to almost a walk and regained stride some 9 or 10 lengths behind the leader Lilac Laurey. “Catwalk” then raced without cover the rest of the way, getting even with Lilac Laurey near the three-quarter pole and then pulling away and winning by four and one-half lengths in 1:59 for her fourth in a row. Fox Valley Catwalk’s season earnings now stand at an even $36,000 after she banked $8,588 in her freshman campaign for Sherman, Illinois owner and trainer Rodney Freese. In the fourth race $10,000 Open Pace Firedrake ($7.60) Mike Oosting) worn down Somestarsomewhere (Sam Widger) and posted a neck victory in 1:53 flat for trainer Payton Ode. Schwarber ($9.20) came charging down the stretch to take the $10,000 Open Trot and give Tim Curtin a driving double on the card. It was the second win in a row for the Curt Grummel trained gelding. Longshot All About Cowboys took second while the even-money favorite Skyway Jaylo held on for third. 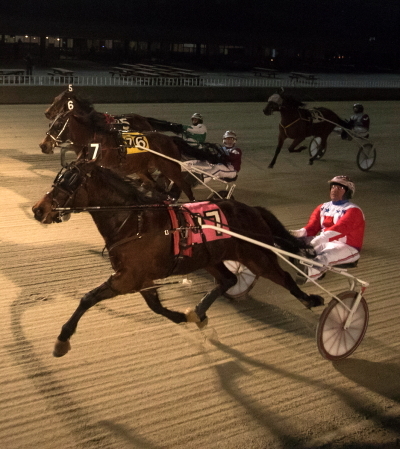 Down to Two: There’s just two racing nights left at the Hawthorne winter meet but there are still some appetizing races left before the Chicago harness racing circuit goes dormant until early May. Tonight’s last Sunday card offers attractive back-to-back Open III pace events, the fifth race for fillies and mares and the sixth for their male counterparts. Both fields were handicapped and drawn by groups. In the nine-horse distaff co-feature the 1-2-3 finishers of the last Open III paces—Rocking Katie (pp 8, Casey Leonard) and Rockin Praline (pp 9, Tim Curtin) and Mystical Nectar (pp 7, Pat Curtin)—drew for the outside slots and figure to get the bulk of the wagering public’s money. The Terry Leonard Stable’s Rocking Katie proved best in their February 3rd encounter. In fact she’s two-for-two at the meet in Open III paces. Runner-up Rockin Praline has been first or second in all five outings at Hawthorne for trainer Tom Simmons and earlier has a three race sweep of a Late Closer Series. Mystical Nectar hasn’t missed a check in four tries for trainer Payton Ode however she hasn’t made a visit to the winner’s circle yet. They’ll be challenged by Morgangetsherway (Juan Franco), Backwood’s Barbie (Brandon Bates), Blissful Pansy (Ryan Anderson), On The Cusp (Sam Widger), Bucklegirl Bobette (Mike Oosting) and Imajean Rocks (Todd Warren), with posts one through six, in that order. The Tom Simmons trainee Aimo Hanover (Sam Widger) was allocated the outside six-slot in co-featured sixth race for males after his easy 1:54 victory last weekend. The 6-year-old pacer sped to a 1:49 flat mile last year at Springfield. The 4-year-old ICF pacer Captain Rhett also bettered 1:50 last summer with a 1:49.3 clocking at Springfield. The Duneside Perch gelding raked in over $145,000 in his sophomore captain with a big hunk of that amount coming from his victory on the Night of Champions in the $180,000 Robert F. Carey Memorial. Mike Oosting will drive for trainer Mike Brown. Gibbs (pp 4, Brandon Bates) also won on the 2017 Night of Champions, taking the Molaro stake for older ICF male pacers. Gabe Henry (pp 5, Todd Warren) did beat Aimo Hanover in late January, the last time they met. The field is rounded out with My Friskie Boy (pp 1, Casey Leonard) and Fox Valley Reggie (pp 2, Pat Curtin). 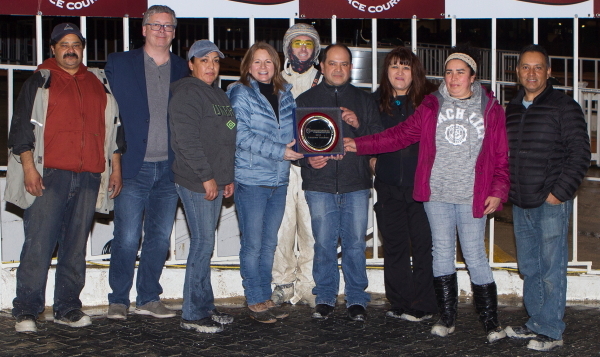 Who would have thought an ICF pacer without $10,000 in earnings at the end of his or her freshman season would be racing for a $25,000 pot on the Chicago circuit in the middle of February? Not Rodney Freese, the owner and trainer of Fox Valley Catwalk the pre-race favorite in tonight’s $25,000 Doc Walker Late Closer Final for state-bred pacing fillies. “I never thought my filly would be going for this kind of money at this time of the year,” said the 53-year-old native of Tuscola, Illinois now based in the Springfield (Sherman) area. Like every trainer and owner in with a finalist in the Doc Walker and Terry Hunt Late Closer Finals Rodney are all smiles with the big purses on the line tonight. As I pointed out in Friday’s story column, the Terry Hunt finale for ICF colts and geldings is definitely one of those take-your-pick events. On the other hand Doc Walker Late final for fillies certainly tilts toward Fox Valley Catwalk’s after prep events the past two weeks. 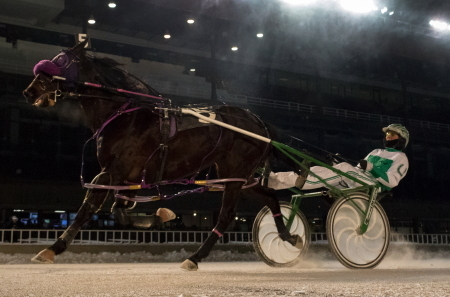 Just as she was in the first Walker prep on January 21, Fox Valley Catwalk was again a comfortable winner for driver Tim Curtin last weekend prep. Like so many horses in their freshman season, Fox Valley Catwalk had some growing up to do and not just in stature. She also needed some better racing luck that she lacked at times as a freshman. It appears both of those issues have changed for her second season. The Sportsmaster filly posted only a single victory in nine tries and put a modest $8,558 on her card in 2017. As a sophomore she’ll carry a three race winning streak into tonight’s co-feature with $11,500 banked and the likely favorite to take home the purse’s $12,500 winner’s share. Tim Curtin drove Fox Valley Catwalk in most of her 2-year-old starts and he has been at her lines in all five outings this year. “Tim gets along real good with the filly,” said Freese. The fifth race Walker finale is the first of two ICF Late Closers on the card with a $25,000 purse. The wide-open Terry Hunt will go as the seventh race with division winners Frontier Frank (Mike Oosting), Sagebrush Shocker (Brandon bates) and Sumpun Great (Casey Leonard) all likely getting plenty of the public’s wagering dollars. Proceeding the two Late Closer showdowns is the fourth race $10,000 Open Pace where four the winners of the last four Opens will tangle—Trashytonguetalker (pp6, Casey Leonard), Fox Valley Nemitz (pp5, Brandon Bates), Somestarsomewhere (pp 3, Sam Widger) and Firedrake (pp 4, Mike Oosting). They’ll be tested by Brooklynite (Todd Warren) and Kelly D (Mike Rodgers) from posts 1 and 2, respectively. Sandwiched in between the $25,000 series champions is the $10,000 Open Trot where Larry Lee Smith’s 7-year-old mare Skyway Jaylo guns for her third consecutive victory when she leaves from the outside six slot. The first five posts will be manned by Allabout Cowboys (Juan Franco), Schwarber (Tim Curtin), Swan Handicap (Brandon Bates), Lou’s Credit Report (Pat Curtin) and Banker Volo (Todd Warren), in that order. No. 3,000 for Ryan: Congratulations go out driver Ryan Anderson who brought home his 3,000th career winner last night with Olivia V in the sixth race. Under the tutelage of his father Joe, the California native began driving in 1999 at the age of 19 and one year later as a 20-year-old became the youngest driver ever to win a Breeders Crown Final when he steered Popcorn Penny to the 3-year-year filly championship. In 2001 Ryan became the youngest to guide a Maywood Park Windy City Pace champion with the ICF pacer Rattle and Rock. In 2007 the now 37-year-old Anderson was Maywood Park’s leading driver. Huge Required Payout: Hawthorne’s Jackpot High 5 will have a mandatory payout Saturday night. The High 5 carryover has grown to $204,195 going into tonight and will be paid out on the ninth and final race on the program. The second legs of last weekend’s Terry Hunt Late Closers were supposed to give us a clearer picture of what to expect in Saturday’s $25,000 Final but instead they made the outcome of the ICF 3-year-old even fuzzier. Last Sunday’s second division pitted the first round series winners Frontier Frank (Mike Oosting) and Sumpun Great (Casey Leonard) against each other for the first time with the winner most likely being labeled the horse to beat in the final. Except Sumpun Great wasn’t himself in leg two and faded rather badly in the lane while the betting favorite Frontier Frank had a nice trip and raced well but as it turned out not well enough, ending up second best behind Sagebrush Shocker (Brandon Bates) from the barn of trainer Kim Roth. While that finish can’t be described as a “shocker” because Sagebrush Shocker finished second behind Frontier Frank in leg one, the Sagebrush gelding did get a pocket trip in the first round one never gained an inch in the stretch on the winner. Just a month ago Sagebrush Shocker was racing in non-winners of one lifetime to be claimed for $8,000 and its $3,000 purses. Saturday night he goes for the winner’s share of a lucrative $25,000 pot. The ICF pacer raced exclusively at Hoosier Park as a freshman going winless in six starts and making less than $5,000. “Ruck” (trainer Ken Rucker) told me that last year the horse just didn’t quite get it as far as the competitive part of it,” said trainer Kim Roth who got the youngster for Hawthorne’s winter meet with the Hunt Late Closer in mind. “As a 2-year-old The horse was doing everything right but he wasn’t quite clicking. “This year everything started to come together and he’s gotten better with every start. He was really good last week. It’s so exciting to be going for $25,000 this week. Sagebrush Shocker will have to be at the top of his game in Saturday’s night’s seventh race co-feature because he’s not the only another sophomore pacer who also pulled off a bit of a surprise in last Sunday’s Hunt divisions. The two betting favorites Special Sauce and Vegas Bomb went off stride at the start of their division and driver Casey Leonard took advantage of their plight with the Ronnie Gillespie Stable’s Sagebrush Sharp, getting away with pedestrian fractions of a 1:01 flat half. Sagebrush Sharp ($10.20) only needed a 30 flat last quarter to hold off Fox Valley Hangten who nosed out Special Sauce for second. While Special Sauce came back nicely to hit the board, Vegas Bomb never did recover and made more breaks later in the race. The draw for Saturday’s Hunt Final went very well for Sumpun Great (Casey Leonard) who landed the rail. Sagebrush Shocker (Brandon Bates) and Frontier Frank (Mike Oosting) drew nicely with the four and five slots, respectively. However Sagebrush Sharp (Pat Curtin) will have to start from the eight post while beaten favorite Special Sauce (Tyan Anderson) starts one slot further outside. Looking to pull off a surprise victory in the Hunt finale are likely longshots Vegas Bomb (pp 2, Sam Widger), Adele’s Big Party (pp 3, Todd Warren), Fox Valley Hangten (pp 6, Juan Franco), Herecomesmagotta (pp 7, Tim Curtin) and Rudy Sage (pp 10, Mike Rogers). We’ll examine the $25,000 Doc Walker Late Closer Final in Saturday’s column.